I was pleased to come upon this blog after I met the author on campus. His approach is less snarky than that of Jim Kunstler, a long-time correspondent of mine whose writing I'd discovered shortly before he visited campus. I love Jim's wit and sense of outrage at the outsized lifestyle of US consumers. For at least this one post, I thought I'd diverge from my musing about virtual worlds to mention Peak Oil and its likelihood, in a time when fuel prices have dropped and some Americans I hear are singing "Happy Days are Here Again" as if sustainability were some sort of 1990s option. Peak Oil is a simple concept: at some point, the planet's entire supply of oil reaches a halfway point. Past that, try as we might, aggregate production falls and keeps falling. New supply does not offset losses of older wells. This happened in the US after 1970, using a model developed by the Geologist M. King Hubbert in the 1950s. Hubbard predicted a global peak in the 80s, but finds in the North Sea offset that. Where are we now? Close to Peak Oil for several reasons. First, the economic downturn stymied new exploration and led to a slowdown in alternative-fuel projects. New discoveries are smaller and harder to develop. Major fields such as Mexico's Cantarell, the North-Sea wells and the Kuwaiti fields are declining. The biggest "elephant" field of them all, the Saudi Ghawar, is widely believed to have past its zenith because the Saudis are injecting it with seawater to keep its pressure up and the oil flowing. As soon as global demand recovers, we are all in for a wild ride, because oil prices will skyrocket as production lags demand and reserves are tapped fast and hard. What sort of world will we build, as the easy oil goes away? Power Down: A life lived more locally, more self-sufficiently, and with fewer luxuries and less driving. Sprawl in the US will shrink to local villages or become abandoned. Commerce will be local. How local and at what pace, no one knows. Here alternative fuels and carefully managed oil supplies permit a gradual scaling back of our habits. I'm using Richard Heinberg's term for this model; his book of the same name is a good read. Long Emergency: Jim Kunstler's term. Here we end up fighting resource wars, facing chaos at home as overfed consumers elect what Kunstler likes to call "cornpone dictator." Globalism falls apart, and we all sink into, at best, a 19th century way of life for the foreseeable future. "World oil production is at or near its peak and current world demand exceeds the supply." "Unless we dramatically change our consumption practices, the Earth’s finite resources of petroleum and natural gas will become depleted in this century." "To guess where this is all going to take us is would be too speculative. 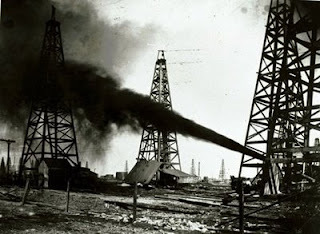 Oil wars are certainly not out of the question." I have heard--and not verified this--that the dearly departed Bush Administration was outraged by this report. They and their oil-baron friends didn't like that sort of news from anyone, especially from the military. Memorial Day is coming and with it, the driving season. With that, gas prices are staying above $2.00 a gallon. Let's hope for Powering Down, with more walking, biking, hybrid, electric, and biofuel cars, and a renewed rail system run from power plants and not on imported diesel. In either model, we'll have to invent a new way of life, and the re-building will be as strange to us all as anything from a virtual world. I'm not betting on any technological dei-ex-machina. I think we'll get along, more simply, with traditional ways of living and some--but not enough--new technologies. A lot more of us will work in agriculture. As for our current level of supersized and suburbanized abundance? It's as much an hallucination as were the housing bubble and funny-money of leveraged debt.